We get discounts for our drivers at gas stations, TIR stops, service centers and roadside cafes. Get discount in Transportica driver mobile app. You know everything about working hours, services and phone numbers. parking, gas station, service center or cafe. You can see the name, working hours and much more useful information on the map. 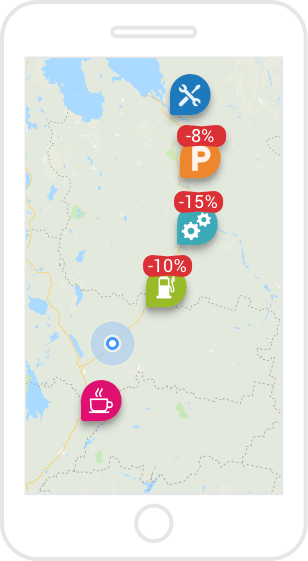 When you need to refuel, park your truck or go to the service center in a new town — use Transportica app, that can show you the best variants. Carrier receives a notification about a new order that fits the characteristics of his vehicle or he himself browses the list of available loads and chooses one. Then he ships the cargo, checks in when he approaches points of loading/unloading with mobile app. After the order is completed Shipper pays the Carrier. Am I obliged to take an order? While looking through the list of available loads or receiving notifications about new orders, you choose the best one for you. If you represent a shipping company, then we recommend you to register as a shipping company. Then you can add all of your vehicles and drivers in your company. If you are the owner of a private vehicle, you need to register the driver, who will take and complete orders.